We can all be honest with each other here—the Musou style games are pretty niche. They fit a very specific role: murdering either people from Chinese and Japanese history, anime characters, and more recently, other video game series. With the release of Berserk and the Band of the Hawk, we can now murder anime people with a vaguely European flavor. Few anime series could have translated better to the Musou games better than Berserk. The main character, Guts, holds the title of the 100-Man Slayer for doing just that in a single night. He’s his own Musou game in a tale that started almost ten years before the first Dynasty Warriors game was even released. 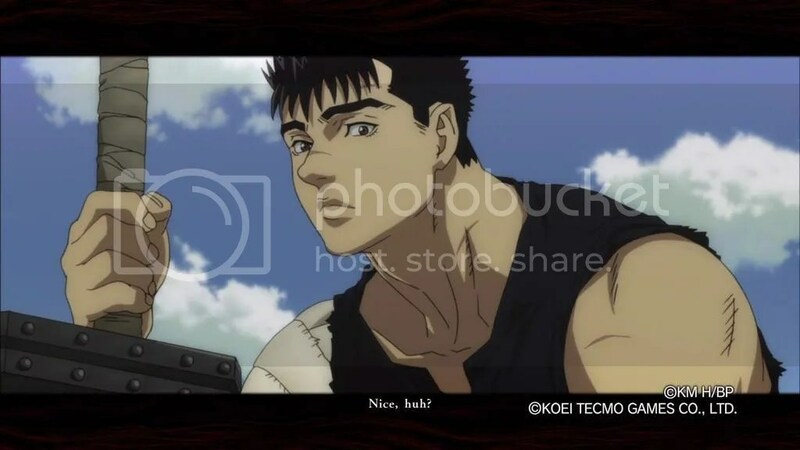 When you total up all the zombies, demons, monsters, and soldiers he’s killed while on his hellish journey across fake-Medieval England, Guts has racked a massive body count that rivals the Musou series. All of this should have made Berserk and the Band of the Hawk the perfect combination. Should have. Let’s start off with some of the positive aspects of the game. Swinging Guts’ sword feels amazing. Each swing comes with its own CLANG! You can feel the screen shudder as you cleave the (repetitive) enemies in half. Once you progress a little further in the game you gain access to the Dragonslayer, Guts’ iconic hunk of iron that is too big to be a sword. Obliterating enemies becomes that much more satisfying as each swing sends monsters spinning. Other weapons become available through the story mode. 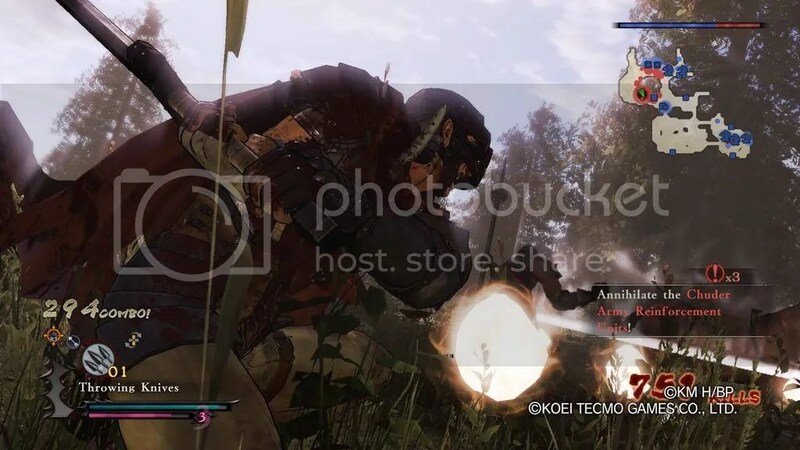 Once you obtain them it adds extra levels of gameplay to the otherwise repetitive combat mechanics, although most of these are limited to Guts. The other characters have their own unique play style, from Casca’s fierce swordplay to Schierke’s elemental magic, making sure that no one is a simple clone of another character. Like every Musou game before it, Berserk and the Band of the Hawk has a Frenzy Mode that fills up the more you slaughter enemies, and the more you use it the longer it lasts. Its a minor addition that encourages players to use it often and not just save it for boss fights but also works to encapsulate the frantic feel of the warrior’s madness that threatens Guts’ sanity. Once Frenzy Mode is active, players can use a devastating Death Blow attack that will send body parts flying. Each character has a unique Death Blow that fits their fighting style, with Guts using a deadly arcing swipe and Griffith’s blisteringly quick slashes. It’s worth noting here that the game asks you if you want to turn down the gore…and the answer is no! If there was an option to add more, I would. As players progress through the story they unlock additional game modes, the most entertaining being the Endless Eclipse. Players can choose whatever character they want and fight their way through a hundred increasingly difficult levels for extra rewards. This is where the game begins to get challenging as delving through the depths of the Eclipse can have your character up against insurmountable odds. Before we hit on some of the negative aspects of this game, let’s touch on one weird one. Much of the game relies on the 2012-2014 animated films to tell the story. These films were dubbed in English with many of the original voice actors reprising their roles from the 1997 anime, including Carrie Keranen as Casca, Kevin T. Collins as Griffith, and Marc Diraison as Guts. But Berserk and the Band of the Hawk only offers the Japanese audio track for the cutscenes. Likely it was to avoid having to have the voice actors dub over the entirety of the ingame dialogue and transitioning between the two languages would have been jarring to the player. It is still a curious decision to have a wonderful adaptation available and not utilize it. Once the player progresses past the events of the movies, the game uses short animations utilizing the ingame models which also feels out of place. A pretty big departure from other Musou is the absence of strategy. Other Musou games require you to at least glance at the mini map from time to time to make sure you aren’t about to lose a vital castle or holdfast. Berserk and the Band of the Hawk has reduced the objectives of the game down to just kill these people, save those people, and break that thing. Taking bases might stem the constant flow of enemies but are rarely required to beat a level. The introduction of mounted combat seems underdeveloped and its only purpose is to quickly travel from one side of the map to the other. Characters only have a limited basic attack and a horse stomp. More often than not you’ll get knocked off your horse by anyone stronger than a basic enemy and end up abandoning the beast all together. The roster is perhaps the most disappointing aspect of the game, as there are only eight playable characters. Certain characters also gain a transformation mode after completing certain aspects of the story mode. 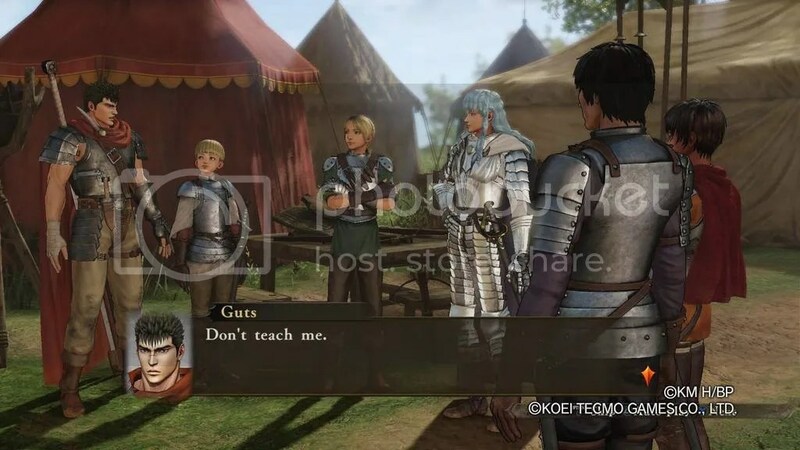 Guts can don the titular armor and Griffith can turn into Femto when they are in Frenzy Mode (after certain story events have taken place) but it doesn’t do enough to diversify the roster. Give us a dedicated Berserk Armor Guts with a completely unique move set, or a gravity manipulating Femto that hovers across the ground and attacks with gravity. On that note, why isn’t Skull Knight a playable character? He’s a knight, with a skull for a head, and has a sword that can cut reality. What more could you ask for? Or anyone from the New Band of the Hawk? Berserk has a fairly substantial cast of characters to pull from but is underutilized in this game. There could even have done a Isidro and Puck duo as a sort of joke character. Not everything in the Berserk world has to be misery and despair and they could have been the perfect pair for a bit of brevity. I might just be beating a dead horse, but Hyrule Warriors had 16 characters at launch and after all the DLC released that number grew to 31. Such a small roster might not have been so bad if there was any DLC in the works but as of this article Koei Tecmo has only released an extra mission pack, a mount pack, and some costumes, at $7.99, $6.99, and $3.49 respectively. Berserk and the Band of the Hawk feels like a more interactive movie and it does that very well. If you’re just getting into the Berserk universe or want a good starting point, the Band of the Hawk does a solid job. Just enough of the story to get you invested and some alright gameplay to keep it going. For long time fans and Musou fans in general, there’s not much going on that you haven’t seen. Berserk is an exceedingly violent series and it certainly isn’t for everyone. For those looking to explore the series expect to find vivid depictions of violence, torture, mutilations, and some very graphic scenes of sexual assault. Think anime Game of Thrones, but with more White Walkers and prettier boys. Take control of Guts and relive the nightmare that is the Berserk manga.